home as a commodity that you are packaging to sell. the listing. Remember-less is more. Too much clutter detracts from any architectural features you may have. items on bookshelves, cupboards and closets. 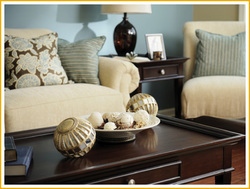 Remove any extra furniture or rearrange furniture to create an open feeling. enhance the architectural features of a home. Clean, clean your home, including: windows, cabinets (inside and out), and closets. Mold and chipped paint are definitely a turn-off for potential buyers. bushes in front of the windows, and make sure that every light bulb works. Do not use any scented plants or scented candles anywhere in your house for tours. Anything small or valuable needs to be removed and stored safely away. Use clean, fresh towels and bedding. Put away pet bowls, beds and the pet when showing the home. Clear off the counter tops.